Norma Redpath was a student at Swinburne during the 1940s and had hoped to sculpt a major bronze piece for Swinburne's Advanced Technologies Centre, but sadly was unable to do so before passing away in 2013. With the assistance of family and donors, an unfinished piece by Ms Redpath commenced in 1982, Door to the Unknown, Monolith, was fabricated for Swinburne's Advanced Manufacturing and Design Centre. Throughout her career, Ms Redpath lived and worked in Australia and Italy, leaving a legacy of works such as the Treasury Fountain, Canberra and the Victorian Coat of Arms, commissioned for the National Gallery of Victoria. In 1970, Norma Redpath received an Order of the British Empire for her services to Australian art and sculpture, which was also recognised by Swinburne in 2006 when she was awarded an honorary doctorate. 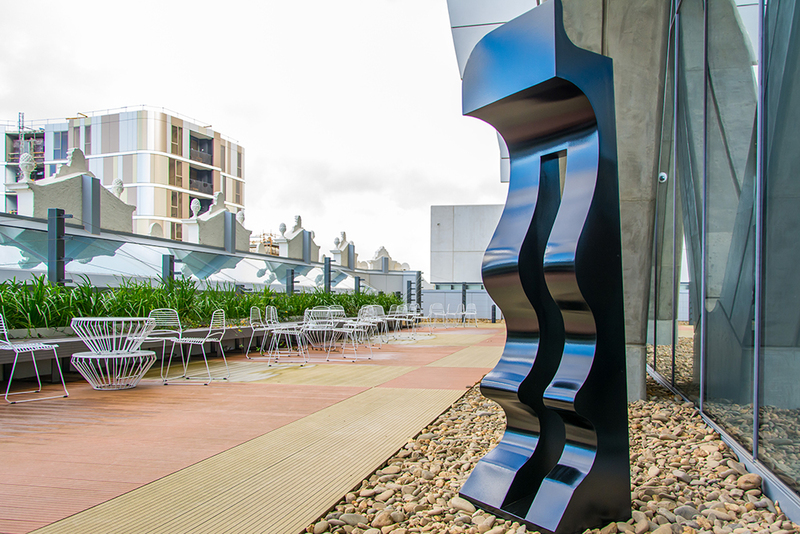 This photograph appeared in the Media Centre release, 'Norma Redpath's final sculpture calls Swinburne home', on 1 Jul 2015.